I feel like my past week has been a never-ending cycle of sleep, internship, Starbucks, sleep, internship, Starbucks - and it's on repeat! Is someone playing a terrible joke on me and by some (not funny) act of magic transported me into Groundhog Day?! Billy Murray...hats off to you! That being said, I have been getting requests lately to make things that are a little more "everyday friendly." Okay, okay, you're right. I mean, let's face it, we don't all have the time to make a fresh lime chiffon cake from scratch. I get it. I am not even sure how I make time to do it myself. Sometimes we just need a simple recipe that we can quickly throw together after a long day at work. Something that is quick and easy, but still packs in the flavor! I came across this recipe this past spring from a family friend. It is everything that you are looking for in a great week night recipe! 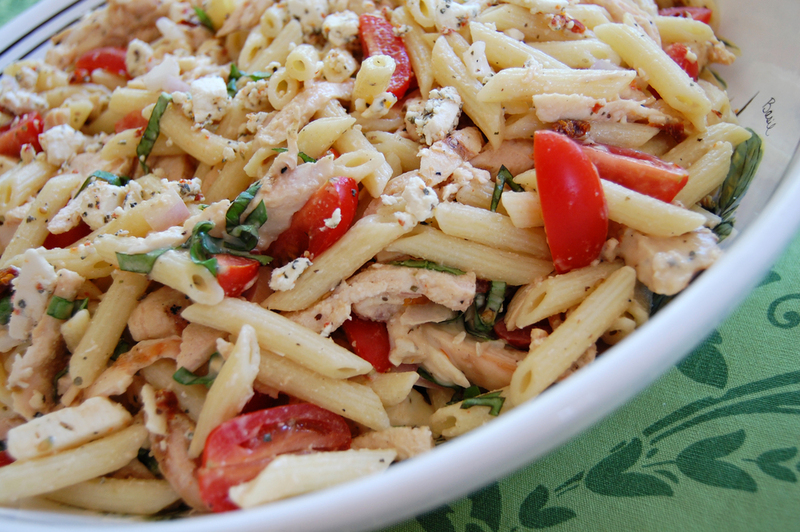 This pasta salad is an awesome dish to bring to a barbecue during the summer or just to make for you family. The recipe calls for penne pasta, if you like this, by all means use it! I find that sometimes that larger pasta can be a bit overwhelming and take over the rest of the dish. I decided to use mezze penne instead - still the same great pasta, just a little smaller and more appropriate for the dish (in my humble opinion). If you have a grill at your disposal, use it! Grilling is always the way to go, especially when it comes to chicken! You'll tend to get better flavors from grilling. But feel free to poach the chicken or use any other cooking method that you see fit. Going forward from here, I am hoping to have an even balance between recipes that are more challenging and obscure and easier "everyday" recipes. I have absolutely loved some of the more difficult recipes - coconut açaí granola, crab ceviche with blueberries and popcorn - but I also notice the need for more practical meal options. That being said, if you have any requests, please let me know! I would love to hear from you! Toss ingredients together and serve at room temperature. Toss while pasta is still a little warm for best results.